This is a quick one, lots of opportunities for the rookies though. I think this match was booked just for my amusement. Alpha Female is one of my guilty pleasures, she is just such a good monster, and the rookies are all just so cute and fun to watch get killed. And the match is under tag rules (for the rookies) so it won’t just be all four in the same ring at the same time. Not that it will likely matter. Mimura is the first one in but she quickly changes her mind and tags in Azumi. She has no luck either and tags Starlight Kid, Starlight Kid goes for dropkicks but Alpha doesn’t budge. Mimura and Azumi both come in but Alpha fights them off and drops Azumi to the mat. Mimura dropkicks Alpha and Azumi hits a DDT while Alpha is on her knees. Backflip into a moonsault by Starlight Kid, all three cover Alpha but it only gets two. Alpha gets back on her feet, Mimura tries to slam her which obviously doesn’t work. Slam by Alpha and she elbows Mimura into the corner, Azumi and Starlight Kid come in but Alpha throws all three in the corner. Alpha charges in, but Starlight Kid and Azumi move so she only splashes Mimura. Azumi hits Alpha with a chair which gives Mimura a chance to apply her rolling leglock, Starlight Kid comes in and hits Alpha with a pole. Alpha gets to the ropes, Azumi dropkicks Alpha but Alpha swats her away. Azumi escapes and tags Starlight Kid, high kick by Azumi and they all try to lift Alpha, but they can’t. Fuka (!!!) gets on the apron and comes in to help, and together all four are able pick up Alpha and toss her to the mat. Body press by Starlight Kid, but Alpha kicks out. Starlight Kid applies a sleeper while Mimura get her chain, but Alpha shakes off Starlight Kid and tosses Mimura to the mat by the chain instead. Lariat by Alpha, Azumi and Starlight Kid come in but Alpha stacks them on top of Mimura and sits on all three for the three count! Alpha Female wins! This is normally an opener type match, which shows that this isn’t the strongest card in the world for two of the five matches to be not something overly serious. Lee is a frequent Freelancer in Stardom, Atenea is a newer Freelancer, and Yoneyama is another frequent Freelancer used by Stardom that hails from YMZ. Atenea is double teamed to start but Yoneyama quickly turns on Lee and stomps down both of her opponents. Lee boots Yoneyama out of the ring but Atenea avoids Lee’s missile dropkick and puts her in a stretch hold. Yoneyama returns and trades armdrags with Atenea, Yoneyama rolls up Atenea but Lee breaks it up. Yoneyama and Lee trade elbows, jumping knee by Lee and she hits a double underhook suplex for a two count. Lee applies a short armbar but Atenea breaks it up, Lee kicks both Atenea and Yoneyama and hits a double dropkick. La Magistral by Atenea to Lee but it is broken up, superkick by Lee to Atenea and Lee suplexes Atenea. Armbar by Lee to Atenea and she puts her in a cross armbreaker, but Yoneyama covers Lee and gets the three count! Kaori Yoneyama is the winner. Not a whole lot to say about this one, just a simple triple threat that was just what you’d expect. Not a great sign that Atenea is already in these types of matches, she may end up just being a one-and-done gaijin invader. Very skippable. Matsumoto continues her crusade against young wrestlers in Stardom. Momo has been improving the last six months, but she is still early in her career and just turned 16 years old. I am not sure how much Matsumoto will give Watanabe here as she is likely cranky after losing in the finals of the Cinderella Tournament. But it will be a big test for Watanabe, she has struggled a bit lately and looks to get back on track. Watanabe doesn’t waste any time as she attacks Matsumoto before the bell rings, dropkicks by Watanabe but Matsumoto finally has enough and gives the kid a hard elbow. Matsumoto stands on Watanabe near the ropes and hits mounted elbows before putting her in a triangle choke. Watanabe gets into the ropes to get the break, she comes back with elbows but Matsumoto kicks her in the head. Matsumoto goes up top but Watanabe elbows her and she hits a dropkick followed by a double knee strike. Watanabe gets on the second turnbuckle and hits a missile dropkick, she gets on the second turnbuckle again but Matsumoto reverses the tornado DDT into a delayed vertical suplex. Body avalanche by Matsumoto in the corner, and she covers Watanabe for two. Matsumoto and Watanabe trade elbows, an exchange Watanabe doesn’t fare well in, Matsumoto goes for a backdrop suplex but Mom reverses it into a roll-up for two. Watanabe kicks Matsumoto in the chest but Matsumoto fires back with a roaring elbow. Big lariat by Matsumoto, she delivers the backdrop suplex and Matsumoto picks up the three count! The winner is Hiroyo Matsumoto. A really unique pairing to say the least. Maya typically plays the role of big gaijin invader, but here she is smiling and teaming with the rookie Kyouna which is quite a shift. Not necessarily a bad one, just not what we are used to from Stardom. The other team is much more normal, as the top two wrestlers of Oedo Tai team up. Oedo Tai will look to further advance their place in Stardom by winning here against the thrown together tag team. Maya and Kagetsu start the match with Maya taunting Kagetsu, Kimura comes in and puts Kagetsu on her shoulders so she is the same size as Maya and together they fight her off. Double dropkick to Maya but Mays drops Kagetsu with a backdrop suplex before tagging in Kyouna. Kimura tags in too, Kyouna is pulled out of the ring and everyone brawls out on the floor. Kimura and Kyouna return after a moment, and Oedo Tai poses with her up on the apron. Kagetsu is tagged back in and she dropkicks Kyouna, Kimura returns and she starts working on Kyouna’s leg. Kyouna fights back with elbows, she tries to shoulderblock Kimura over but Kimura spits in her face. Kyouna finally manages to knock her off her feet and tags in Maya, Maya boots Kimura but Kimura boots her back. Sidewalk slam by Maya, and she covers Kimura for two. Maya goes for a chokeslam but Kimura blocks it and tags Kagetsu. Swandive missile dropkick by Kagetsu and she hits a jumping elbow in the corner, she tries to pick up Maya but Maya elbows her off. Big spear by Kagetsu, she picks up Maya but Maya boots her away and hits a scoop slam. Swinging side slam by Maya and she tags in Kyouna, shoulderblocks by Kyouna and she catches Kagetsu with a powerslam for a two count. Backbreaker by Kyouna but Kagetsu uses the referee to get out of it, Kyouna goes to shoulderblock her but Kagetsu pulls the referee in front. Kimura comes in with a metal rod and starts hitting people, but she hides it before the referee recovers. Samoan Drop by Kagetsu, but Maya breaks up the cover. Maya then lariats both Kagetsu and Kimura, chokeslam by Maya to Kagetsu and Kyouna gets on her shoulders to hit a diving body press for two. Act comes up and spits Sake at Maya, Kagetsu hits a sign and hits Kyouna in the head with it. Ebisu Drop by Kagetsu, and she picks up the three count! Kagetsu and Kyoko Kimura are the winners. A good and effective match, although not necessarily memorable. There were a handful of really nice spots here, such as Kyouna hitting the splash off of Maya’s shoulders, although I have to say it was a bit odd for Maya to suddenly be on the ‘good guy’ side after being the monster heel during her run in Stardom dating back to last summer. 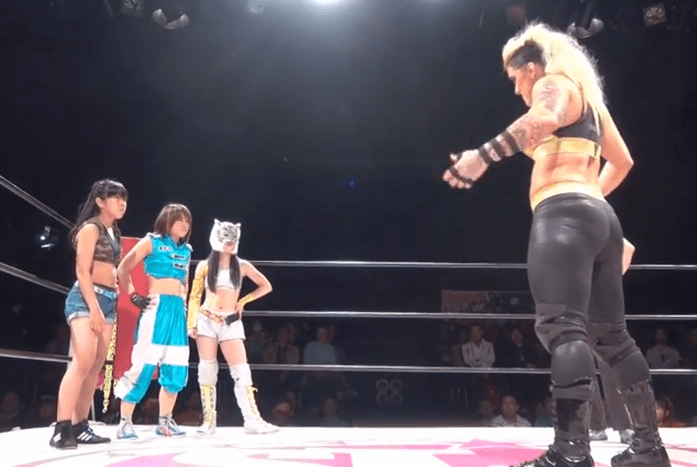 The beatdown on Kyouna was fine but generally uninspired, I did like the ending though with as usual Act getting involved and Kagetsu cheating to win. I don’t mind having a heel cheating faction in any promotion, as long as it doesn’t get too out of hand as it adds some variety to the cards. Overall a decent match, and again I am glad to see Oedo Tai picking up some wins here in the midcard. The big main event, and arguably the only meaningful match on the card. The teams may seem random, and would be on most tours since Iwatani and Shirai are tag champions, but it does make sense in this context. On May 15th, Shirai is facing Iwatani and Garrett is facing Hojo, so it is like a sneak peek of what those title matches will be like while also allowing the wrestlers to get some chemistry (more so for Garrett since the rest are quite familiar with each other). Really any result is possible in a match like this since no matter what happens it will help further along the storyline. Hojo and Iwatani jump their opponents before the match even starts, they knock their opponents out of the ring and Hojo hits a jumping elbow off the apron. Iwatani then goes up top and delivers a diving crossbody down onto both Shirai and Garrett. Hojo and Garrett return to the ring, Iwatani comes in too and Garrett is double teamed. Hojo continues the beating of Garrett, she tags in Iwatani and Iwatani picks up where Hojo left off. Iwatani kicks Garrett repeatedly, Hojo returns and she elbows Garrett into the corner. Garrett fights back and kicks Hojo into the corner, Space Rolling Elbow by Garrett and she kicks Hojo in the chest. Garrett makes the hot tag to Shirai, Iwatani comes in too and she gets into it with Shirai which gives Hojo a chance to recover. Shirai smacks Iwatani to the mat and then dropkicks Hojo, catapult elbow by Shirai as she jumps off of Hojo to hit the move but Hojo blocks the double underhook facebuster. Garrett knees Hojo from the apron to help Shirai get back into control, she puts Hojo in a stretch hold while Garrett does the same to Iwatani. Shirai stomps down Hojo in the corner but Hojo hits a big spear when Shirai charges in for the double knee. Hojo tags Iwatani, Iwatani and Shirai trade elbows until Iwatani hits a headscissors. Shirai avoids Iwatani’s dropkick and stands on her throat, more kicks by Shirai and she puts Iwatani in the armtrap crossface. Iwatani makes it to the ropes, she avoids Shirai’s Tiger Feint Kick and drills her with a dropkick while Shirai is against the ropes. Iwatani goes for the dragon suplex but Shirai elbows out of it, high kick by Iwatani and she hits a superkick. Another one by Iwatani and she hits a third, again Shirai gets out of the dragon suplex and Shirai drops Iwatani with a German suplex hold for two. Garrett and Hojo are both tagged in and trade strikes, Garrett rolls Hojo into a pin attempt but Iwatani breaks it up. Hojo goes up top and she nails the diving elbow drop, she is slow to cover which gives Shirai time to break it up. Hojo puts Garrett in a stretch hold, Iwatani goes up top and hits a diving footstomp onto Garrett’s midsection. Garrett is set up in the Tree of Woe, Hojo goes up top but Shirai comes over and pulls Hojo off the top turnbuckle while simultaneously hitting a swandive missile dropkick on Iwatani. Shirai is truly the best in the world. Garrett goes up top and hits a diving crossbody on Hojo, but it gets two.Rolling vertical by Garrett into a DDT, she goes for the Shining Star Press but Hojo grabs her leg and Iwatani hits an enzuigiri. Iwatani goes to kick Garrett but kicks Hojo by accident, Shirai runs in and she hits a tombstone piledriver on Iwatani but landing on top of Hojo. Shirai goes up top and hits a moonsault, Shining Star Press by Garrett and she gets the three count! Garrett and Shirai win the match. I feel like a broken record when reviewing smaller Stardom shows, however they all follow the same basic formula: five matches with under an hour of total ring time, some decent mid-card matches, and then a great main event. This one followed that same path, as really only the main event needs to be seen but if you are in the mood for a full show nothing was really offensive. As an Alpha Female mark, I’d recommend also seeing the opener if you only have time for a couple matches, it was quite entertaining as well. I appreciate being able to see every Stardom event with Stardom World, but shows like this can probably be skipped by the more casual fan if time is an issue.